On my trip to Grays station this morning, I took the 9:09 train from Harringay Green Lanes station to Barking station, where I got a direct train to Grays. The three Class 378 trains seem to be coping and the four-car train was not overly full. In the short trip, a lot of passengers don’t seem to do more than one or two stations. There were even several big cases and a couple of buggies. There were spare seats all of the way. If nothing else Bombardier’s late delivery of the Class 710 trains, has brought the qualities of the Class 378 trains to the fore. As the Class 710 trains will have the same layout, I suspect when they are in service, there will be loads of space all day, until new passengers fill them up! As they always do! One of my local stations on the North London Line is Dalston Kingsland station. Unlike Hampstead Heath station and the three neighbouring stations of Canonbury, Dalston Junction and Hackney Central, there are no lifts at Dalston Kingsland station and the stairs are narrower without a central rail. Looking at the passenger traffic at the stations I have mentioned, gives the following numbers for 2017-18 in millions. Dalston Kingsland serves almost as many passengers as does the nearby Dalston Junction, but it is a very inferior station. Recently, a high capacity wide gate-line has been installed. When trains call at the station, it is difficult to get to the platforms, unless you wait until arriving passengers have come up the stairs. More housing is being built around Dalston Kingsland station. In December 2018, the train frequency through Dalston Kingsland was raised to eight from six trains per hour (tph). Is Dalston Kingsland station an accident waiting to happen? Various plans and other improvements will effect the passenger traffic through Dalston Kingsland station. In Gospel Oak-Barking Fleet Plan Remains Unclear, I calculated that running the current combined eight tph service between Stratford and Clapham Junction/Richmond needs twenty trains. Increasing this service from four tph to five trains per hour to both Western termini, would increase the frequency between Stratford and Willesden Junction to ten tph. It would also require twenty-five trains to run the service. London Overground has six five-car Class 710 trains on order, that will be used to improve the service on the North and West London Lines. This would leave a spare train to cover failures and maintenance. So it would appear that Dalston Kingsland station could get a train every six minutes in both directions. Passengers would appreciate this, but what about the freight operators, that use the line? Will a twenty-five percent increase in train capacity result in a similar increase in passengers using the stairs at the station? In London Overground Syndrome, I described the syndrome like this. This benign disease, which is probably a modern version of the Victorian railway mania, was first identified in East London in 2011, when it was found that the newly-refurbished East London Line and North London Line were inadequate due to high passenger satisfaction and much increased usage. It has now spread across other parts of the capital, despite various eradication programs. The North London Line through Dalston Kingsland station seems to have a particularly strong form.of the syndrome. In December 2018, the frequency through the station was increased by thirty-three percent, but overcrowding in the Peak seems not to have reduced. Could it be that because the line offers a more pleasant and easier connection between Stratford, Highbury & Islington, Camden, Hampstead, Willesden, Clapham Junction, Acton and Richmond, that any increase in capacity is welcomed and passengers transfer from a more crowded Underground? There will be more Ducking and Diving! I suspect only educated guesses can be made, as to what effects Crossrail will have on Dalston Kingsland station. Judging by the number of passengers, who get on and off Overground trains at Highbury & Islington station, a lot of passengers use the North London and Victoria Lines for commuting and other journeys. Crossrail, with its connection to the North London Line at Stratford and eventually at Old Oak Common will take passengers from the North London Line and the various connections between the two lines, will further even out passenger traffic. If it does, it will be Londoners Ducking-and Diving again! I think that some groups of passengers will avoid Dalston Kingsland station. Like me, some travellers have a choice of station. Passengers walking between the two Dalston stations, may choose to use the shorter step-free interchange at Canonbury. As the frequencies on the Overground increases, passengers may find that a less obvious route is better for them. I suspect some savvy passengers take a train from West Croydon at Dalston Junction station and then cross the platform at Highbury & Islington station. It’s classic animal behaviour to avoid problems and go by a better way. The Northerrn City Line between Highbury & Islington and Moorgate stations could have an effect on passenger numbers at Dalston Kingsland station. In a couple of years, the line will be much improved. Services will be running seven days a week. Elderly Class 313 traiins will have been replaced by new Class 717 trains. There will be a step-free connection to Crossrail at Moorgate station. Frequencies will be significantly increased. Overall, there will be a new high-capacity line running North-South within walking distance or a couple of bus stops of the two Dalston stations. I have already started to use the line more, by catching a bus to Essex Road station for a train to Moorgate station. It’s quicker in the morning Peak. I remember using the North London Line in the 1970s, between Broad Street and Willesden stations. It was terrible. But now, when High Speed Two opens in 2026, London’s Mucky Duck which has grown into a swan, will speed you to Old Oak Common station for your journey to the North. Because many of these travellers will have heavy bags with them, all stations on the North London Line must be made step-free. Highbury & Islington station was rebuilt for the Victoria Line in the 1960s, when costs were much more important than passenger convenience. The area outside the station is being sorted, but the plans are starting to be developed to create better and step-free access to the deep level platforms. A much improved Highbury & Islington station would create a lot of easier routes from both Dalston stations. Essex Road station has lifts, but is not step-free as the lifts go to well below the platforms, to which the final connection is a long set of steps. The station sits on what must be a valuable site in Islington, which would be ripe for redevelopment. Redevelopment of this station will happen and it will make things a lot better for me, as it is within my walking range or a short bus ride. When I moved to Dalston in 2010, there was a good bus service to Highbury & Islington station along the Balls Pond Road. But now, a South London Mayor has cut this, because I suspect we can use the Overground. But this assumes that Dalston Kingsland station is has quality access. Which of course it doesn’t! The buses must be improved along the Balls Pond Road. I’ve deliberately left this to last, as it is the biggest and most difficult. There are two routes through Dalston Kingland station. Four tph on that use the West London Line to go to Clapham Junction station. Four tph on that use the North London Line to go to Richmond station. One or both of these routes might be possible to be run by six-car trains using selective door opening on the short platforms. Lengthening the new Class 710 trains will not be a problem, as a few extra coaches would be ordered. On the other hand lengthening the existing Class 378 trains may be more problematical, as they are out of production. I suppose that two five-car trains could be converted into a six-car and a four-car. Six-car operation would surely add twenty percent to the passengers going through the station. The extra trains and capacity through Dalston Kingsland station will increase the pressure on the inadequate access at the station. But some of the other improvements will divert passengers from the station and take the pressure off. I suspect that Transport for London are hoping this will be sufficient action to keep the station functioning at a comfortable level, until it is rebuilt for Crossrail 2. But that is a tough ask and could contain a lot of wishful thinking. Dalston Kingsland station needs lift and wider and safer stairs in the near future. Checking this morning, it appears that four trains per hour (tph), which has been flagged up all week, will not be happening tomorrow according to the on-line timetable. Have Bombardier And Transport for London Pressed The Publicity Button On The Gospel Oak To Barking Line? 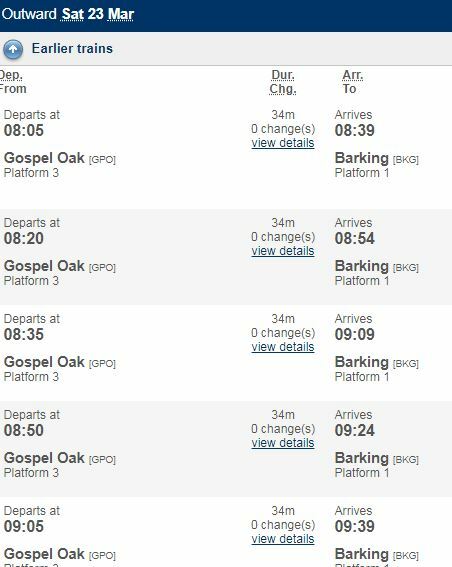 This morning, both the National Rail and Transport for London Journey Planners are still showing a Saturday March the 23rd service of four trains per hour (tph) on the Gospel Oak to Barking Line. To run a four tph service will need six trains, which is a bit difficult with only three four-car Class 378 trains. Both timetables are wrong. But they have been like that all week and surely a mistake would have been rectified. They have shortened three more Class 378 trains and these will be joining the party. But it is known that other lines are under pressure because of the smaller fleet, so this is unlikely. Three Class 710 trains will come to the aid of the party. Possibility three is the only practical one. There is also another event on Saturday. A steam train will be passing along the route, with these tiomings. The steam train will also be coming back later in the day. Is it a coincidence that it appears the full four tph electric service on the Gospel Oak to Barking Line starts on the day that a steam train uses the route? Think of all those publicity pictures! Or has it been organised to see if the steam trains interfere with the sophisticated computing on the Class 710 trains? Should The Three Class 378 Trains Saving The Gospel Oak To Barking Line Be Named? Lots of passengers will be eternally grateful, if over the next few or more weeks, the three Class 378 trains, currently working the line provide an acceptable service across North London, until the Class 710 trains take over the route. So after they return to normal service should they be given names? I would suggest Faith, Hope and Charity, as these names wouldn’t cause offence to anyone. But they would constantly remind the Mayor, Transport for London and Bombardier, that their failure to plan properly for non-arrival of the Class 710 trains, could have had a much more embarrassing outcome. In some ways, London Overground’s Class 378 trains are the ultimate Electrostars. These ten-year-old trains are no high-performance trains, but they are people carriers par excellence. Wikipedia describes their interiors like this. The design is similar to the Class 376 trains used by Southeastern, featuring the same wider metro-style sliding pocket doors for more efficient boarding and alighting. 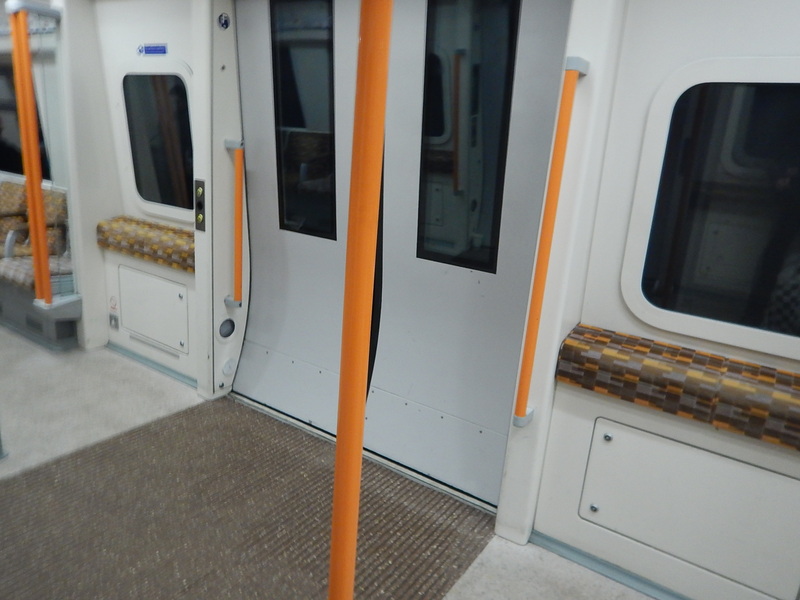 However, it also has significant differences from the Class 376, such as fully longitudinal seating similar to that used on London Underground rolling stock to give more standing and less seating capacity and reduce overcrowding, suitable for the high-volume metro-style services on London Overground. This picture shows a view through the five cars of a standard-length train. At the present time they are the only heavy rail train with this seating layout. 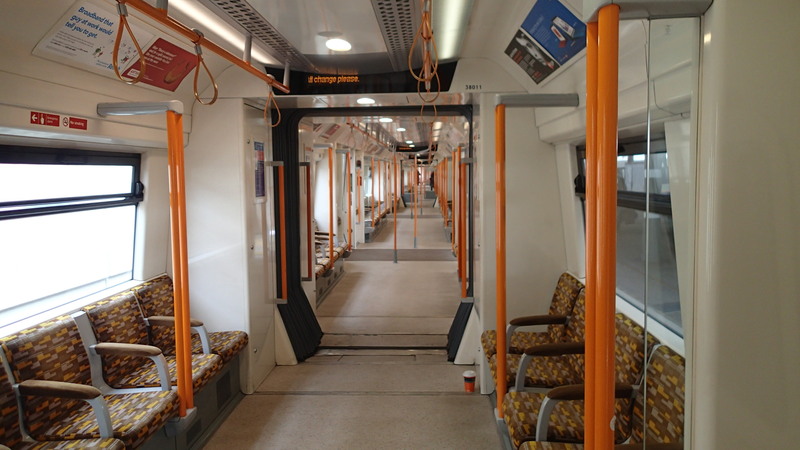 Although London Overground will soon be running some Class 710 trains with a similar layout. The seats are reasonably comfortable. All passengers get at least one arm-rest. Passengers can walk between cars to find a seat or more space. The aisle between the seats is wide enough for passengers to stretch their legs and others to walk through, when all seats are taken. There’s plenty of space for standees and lots of handholds. In less busy times, everybody gets at least one seat. There are also wide lobbies and doors for easy embarking and alighting. Note the perches either side of the door and the numerous handholds. In my travels across Europe, I’ve never found a better inner-city commuter train. To run a four trains per hour (tph) service on the Gospel Oak to Barking Line, ideally eight trains are needed; six to run the service, one in maintenance and a spare. But all London Overground can scrape together is three Class 378 trains shortened to four-cars. This limited number of trains can only run a two tph service. The four-car Class 378 trains have 152 seats (including tip-up seats) and thirty-two double perch seats. The two-car Class 172 trains have 124 seats. This gives these seats per hour for the two services. The Class 378 trains may offer less seats, but each four-car train can hold a lot of standees. This article on Railway Gazette is entitled London Overground Class 378 Ready To Enter Service, says that four-car versions of Class 378 trains can hold up to 700 passengers. If you’ve ever travelled on the East and North London Lines around Dalston in the Peak, you’ll know how many people these trains can hold at a push! Since the two tph service started yesterday I’ve done several trips on the Gospel Oak to Baring Line over two days. Only the last trip can really be considered to be in the Peak. I have the following observations on the Off Peak trips. There were typically at least twenty per cent of seats available. No-one was ever forced to stand, although some were. A proportion of passengers were doing short trips of one or two stops. Some stops like Crouch Hill, Blackhorse Road and Leyton Midland Road seemed to have more passenger traffic than others. The trains had more passengers towards the Barking end of the route. I asked a few passengers, if they’d had to wait long and all said, they’d read the timetable and arrived accordingly. The usual accessories like dogs, buggies and baggage were carried by a proportion of passengers. Two station staff said passengers were only complaining about the frequency. It appears to me, that Off Peak journeys on the route will be adequate if not as frequent as passengers want. I have the following observations for the single Peak journey at 07:33 this morning. Nearly all seats were taken for the whole route. Dwell times were slowed at certain stations, due to the numbers wanting to enter and alight. All standees had a decent hand-hold. Some passengers were still doing short trips of one or two stops. Blackhorse Road with its connection to the Victoria Line was busy. A staff member told me, that it all gets less busy after eight o’clock. I should also say, that one passenger was complaining hard, as he had to stand for his short journey from Crouch Hill to Gospel Oak. But then he was dressed like he would pay for a First Class seat. On arrival at Gospel Oak, I took a North London Line train to Hampstead Heath and that was carrying more passengers per car.. This added a perspective to the trip. But then, in my part of London, at times, there are more overcrowded trains that I use regularly. The Central, Victoria and Northern Lines on the Underground. The North and East London Lines of the Overground. The Northern City Line into Moorgate station. Today’s Peak trip was no worse, than some I’ve experienced in the North of England. The three gallant Class 378 trains are coping well and if they don’t suffer any failures, I suspect they can hold the line, until reinforcements arrive. My trip today, illustrated the strengths of the train design as a large number of passengers were transported in a half-hour journey across North London. Bombardier must also be pleased that it is three of their ten year-old-trains, that have been quickly reconfigured and have made up for their software shortcomings, that are causing late delivery of the Class 710 trains. I just took a short ride between Harringay Green Lanes and Gospel Oak stations. At Harringay Green Lanes station, this was shown on the station display. Saturday 16th to Sunday 22nd trains will be 30 minute intervals. At Gospel Oak station, this was shown on the station display. I was also given a leaflet, which said. Trains will run about every 30 minutes on weekdays, calling at all stations. It also said that there will be service changes at weekend and on public holidays. So what does the National Rail on-line timetable say? For four tph, that means they have to find three extra trains. Are they Class 710 trains or have they borrowed some surplus Pacers from Northern?